An unlikely connection. | Really??! An unlikely connection. – Really??! What does a 25-year-old, 300-pound NFL offensive tackle have in common with a 60-pound 9-year-old kid who played one season of flag football in third grade before deciding that it was too early and too chilly to ever want to do it again? Throughout Michael’s journey of having his meniscus and ACL repaired at such a young age, there have been few perks for him. Thankfully, we live in a suburb of New York City, so we’ve been able to get him excellent orthopedic care at Hospital for Special Surgery. And because we see surgeons there, on occasion, Michael has gotten to meet a professional athlete who is also being treated by these surgeons. The doctor who performed Michael’s meniscus surgery in October happens to be the team orthopedist for the Knicks, and we bumped into J.R. Smith just a few hours before the surgery. A month and a half later, Dave took Michael to the hospital for his first post-op appointment after his ACL repair, and to have his stitches removed. On the way down the hallway, they briefly saw a man so large and athletic looking that they assumed he was a football player. And that man – Kansas City Chiefs offensive guard Jeff Allen – saw Michael as well. Curious and concerned that someone so young had appeared to have undergone such a serious procedure, Jeff asked the office staff if he could say hello to Michael, and maybe offer him some reassurance. After all, he was here for a surgical follow-up with the same doctor for his own season-ending injury. Unfortunately, Michael was already in an exam room, having stitches removed from his five incisions, and the staff thought it would be best not to disturb him. Hey Mike! I didn’t get to formally meet you. 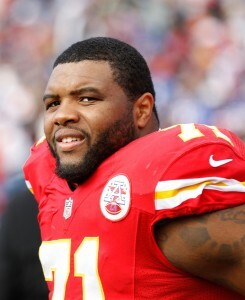 My name is Jeff Allen and I play offensive line for the Kansas City Chiefs. I saw you in passing while you were in a wheelchair at HSS and I wondered what happened to this little guy! I’m so sorry you have to go through this, but know everything happens for a reason and it’ll only make you stronger. I’m also on the road to recovery just like you. I tore my bicep tendon during the first game of the year and had to get surgery. I decided to fly all the way to New York from Kansas City to get my surgery because HSS is one of the best hospitals in the world for surgery! So no worries – your doctors did a great job. Get that ACL back to 110% like a champ! We were impressed that someone with so many other things going on took the time to e-mail a boy he’d never met. But what happened after that impressed us even more. In typical 9-year-old fashion, Michael replied to Jeff’s initial e-mail with a brief message. What we didn’t find out until a few weeks later was that Michael had e-mailed Jeff a few more times — to ask how his recovery was going, to tell him that he’d picked Jeff for his “team” on his Madden Mobile game, and to let Jeff know that he’d been given the okay to walk around without crutches at home. That’s great to hear, man! Glad you’re healing up well. I’m actually close to being fully recovered. Wassup Mike! I’m fully recovered, and it’s good to hear that you’re feeling a lot better. Keep working hard in rehab. I know you’ll come back even stronger than before. Dave went back to Twitter to thank Jeff for keeping in touch with Michael. Jeff replied that Michael was “now his little buddy,” and that he was happy to do it. 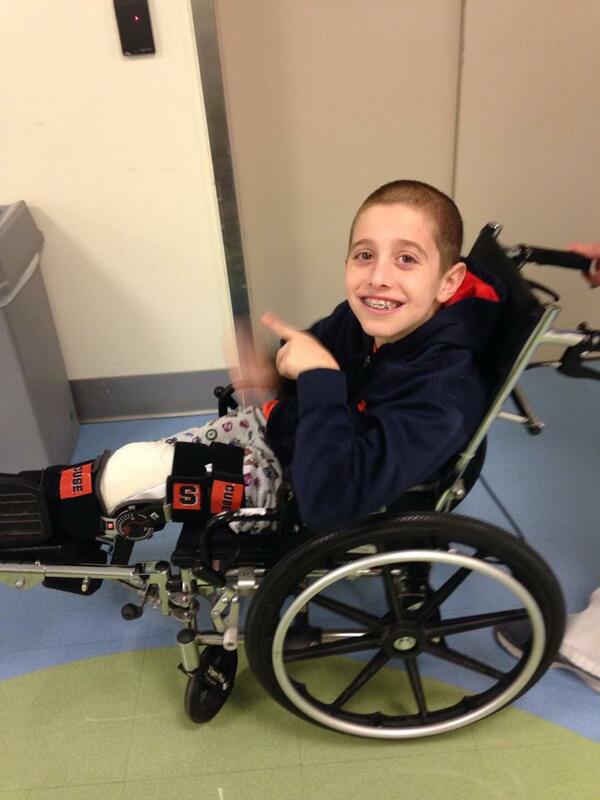 Thank you, Jeff Allen, for understanding that being in the NFL gives you the power to give a boost to a 9-year-old. Thank you for understanding that you have more in common with this boy than many people might think. Thank you for knowing that the few minutes it might take you to reply can lift Michael’s spirits more than you can imagine. Thank you for giving him the same supportive messages that come from his family, but can sometimes carry more weight because you understand what this kind of injury really means to someone who loves sports. We are now fans of the Kansas City Chiefs. And especially the offensive tackle with the big heart. ← What’s RIGHT in Youth Sports. How awesome! Always warms my heart to know there are so many kind, caring people in this world.